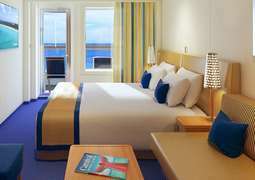 Carnival Horizon offers guests a wide choice of cabin category ranging from Havana staterooms with exclusive perks, to spacious Family Harbor suites with access to the Family Harbor Lounge with board games, movies and more. 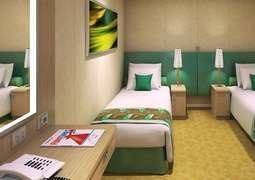 There are also Inside Cabins available. 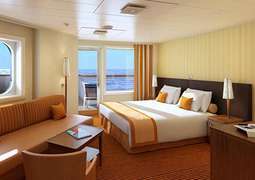 Each cabin category offers spacious accommodation with amenities such as private bathrooms, comfortable beds ensuring a great nights sleep, as well as technical amenities including a telephone. 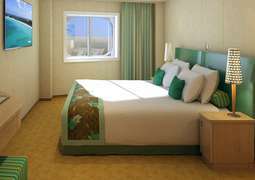 Guests are sure to find everything they need to have the perfect cruise experience. Passengers will not be left disappointed with the range of culinary options that await onboard Carnival Horizon. Guests can choose from options including laid-back seafood with 360 degree views at "Seafood Shack", sample sushi at "Bonsai" or premium cuts at the Steakhouse. Enjoy a more relaxed meal at the main dining room or the Lido restaurant. A Carnival cruise cannot be described as boring with the wide range of entertainment on board. Try the unforgettable experience of Skyride, where you ride around a suspended course above the ship. Watch a movie at the Multiplex, with both an IMAX and 3D experience theaters. You can also enjoy a night of music and performance at the Playlist productions show, or watch the Lip sync battle. Choose between an evening of live music at the bar or create your own at karaoke, whatever you decide you'll be sure to make great memories. Have a blast with all the family at Waterworks, the onboard water park. 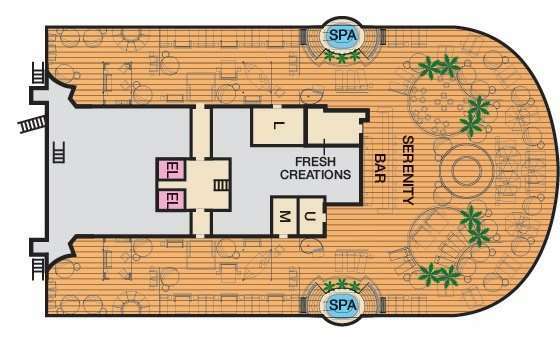 Adults can enjoy some downtime at Serenity, an adult-only sun deck complete with loungers, outdoor whirlpool and salad bar. Cloud 9 Spa offers treatments such as facials and massages as well as a number of thermal suites to ensure the ultimate relaxation experience. There's also a range of sports facilities such as group fitness classes, volley ball and a jogging track.